This gallery book documents the travelling exhibit »Keep Your Eye on the Planet«. The exhibit consists of 45 textile works measuring 60 x 60 cm, made by european women. 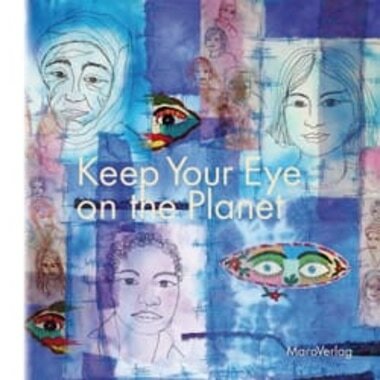 The challenge called for the incorporation of at least one eye, embroidered in Afghanistan, in a textile work of art interpreting issues facing our planet. Among the 45 works chosen by the jury, many addressed ecological issues such as pollution or biodiversity in the ocean. Poetically or provocatively, attention was drawn to the animal world and species extinction; in other works the focus was on the planet‘s flora. Several titles convey directly the message in the fabric: »You can’t eat trash«, »Where has all the plastic gone?«, »Look closely, think, act now!«. The command, »Save the Planet« demands our immediate attention and action. Compassion for our fellow man is ardently expressed in many submissions, i.e. »We are all migrants on earth«, »The Freedom Dreamers« and »Give a face to the people«, all addressing the topic of migration. »The Children are the Future« und talkaboutchildlabour look at the role of children in present and future society. 192 pages, hardcover, thread binding, 22 € incl. postage, ISBN: 978-3-97512-552-8, published by MaroVerlag. Look inside the book by viewing an excerpt as a pdf file. 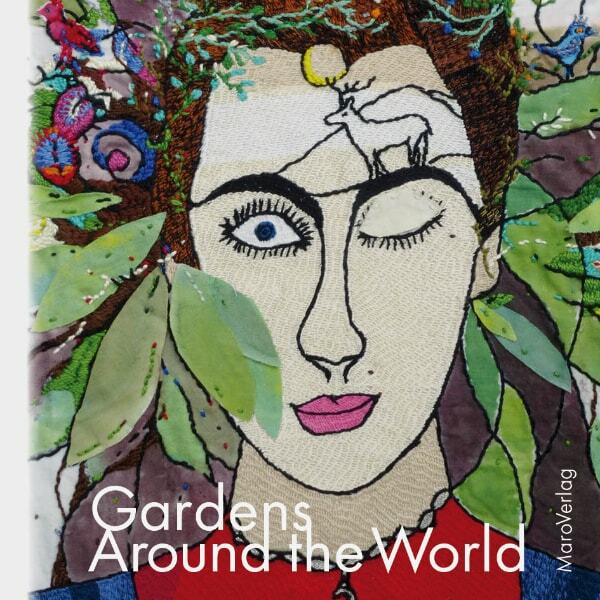 This book documents a unique intercultural exchange project: Sending textile works about the topic of “garden” on a journey across the world to be crafted by four hands was the basic concept. There were three stages to this adventure: Europe – Afghanistan – Europe. The starting point was an invitation to participants across Europe inviting them to submit textile designs in A3 format presenting their ideas of gardens. To these designs, embroiderers in Afghanistan reacted with their own personal supplements. All the participants were at liberty to design the pieces in their individual styles. In December 2015, a jury selected 72 of the European works submitted. These works in progress were flown to Afghanistan in February 2016 and distributed to the embroiderers to be continued. Their ideas of gardens and aesthetic concepts – sometimes very different – were expressed in these works. After that, the pieces were returned to their European creators to be continued and finished according to their own ideas. Some of them decided not to change anything; some added parts here and there; still others “dug up” whole garden again. The gallery book “Gardens Around the World” does not only present the finished pieces, but reveals the single steps in the creation of each of them, a process scarcely to be guessed at in many cases. The results show how people from completely different backgrounds enter into an exciting dialogue through the language of textile art. Numerous colourful images of details make this book into a walk in a botanical garden of the textile arts. 168 pages, hardcover, thread binding, 20 € incl. postage, ISBN: 978-3-97512-552-8, published by MaroVerlag. This book gives an interim report five years after initiation of the embroidery programme in Laghmani. 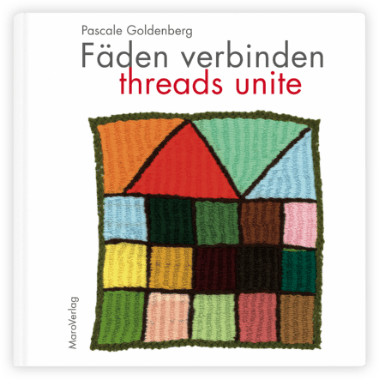 It is not intended as an ethnological dissertation, but as a personal account of impressions gained by the author Pascale Goldenberg during her visits with the women there. Above all, she was deeply moved by the unbelievably strong will to survive shown by the women in daily life, and by the unsuspected artistic potential they possess. Despite dramatic war experiences and a very strict traditional culture, plus a minimum of information from the free world, these women are capable of embroidering freely (using no prefabricated patterns) with great joy and enthusiasm. These works are sometimes artbrut, sometimes naive art. They are nothing less than works of art, which appeal to and deeply move our European souls. In addition to presenting results from the successful embroidery project, this book includes “answers” by the European women who used the embroidered squares in their works, and so in this unusual way have taken up communication with the women of Afghanistan. At a time when practically daily, and that for many years, almost only bad news from Afghanistan reaches the western world, the author is pleased to report on positive developments. The vigorous and colorful embroidered pieces by the Afghan women deliver proof of the true strength, freedom and creativity possessed by the women of this oppressed land. 120 pages, hardcover, thread binding, 20 € incl. postage, ISBN: 978-3-87512-754-6, published by MaroVerlag.